Clinical labs need to be able to process samples down to a short list of variants and publish a professional report. Two common clinical applications for genetic tests include Cancer Gene Panels and Whole Exome Trios. 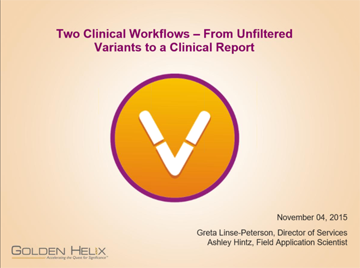 Using VarSeq and VSReports, we will demonstrate how easy it is to go from a variant file created by a secondary analysis pipeline containing unfiltered variants to a report containing information for variants of interest. Along the way we will discuss tips and tricks and answer frequently asked questions to help you get the most out of your data!